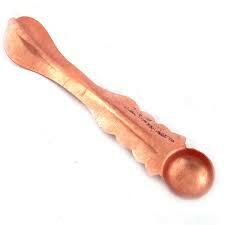 A ritual spoon of brass, copper, or five-metals often made with great ornamentation. It consists of a circular bowl- usually a plain hemisphere or an ornate flower-cup- to which a long handle is attached. The handle is often in the form of Vishnu, Kaliya damana Krishna, Hanuman, entwined snakes, or a multi hooded cobra. These spoons were used in household and temple rituals for symbolic purification with sacred water by transferring ritual water from one container to the other, or for sprinkling water in various directions, or for pouring ghee into the lamp, or sacrificial fire or for drinking ritual water as prasada for the grace of god.